Author: Wernher von Braun, Willey Ley, Fred Whipple, Joseph Kaplan, Heinz Haber, Oscar Schachter. Edited by Cornelius Ryan. 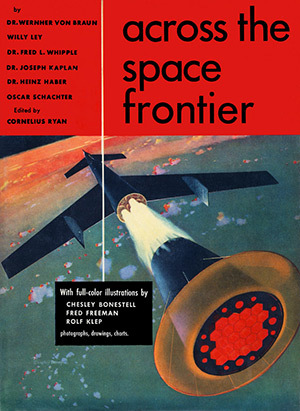 This is the first in a set of three books that are expanded treatments of a series of articles that appeared in Collier’s magazine beginning in 1952, co-authored by Wernher von Braun and including color illustrations by the father of space art, Chesley Bonestell. The other two books are Conquest of the Moon and The Exploration of Mars. The articles and books were also the basis for a series of three television programs by Walt Disney (Man in Space, Man and the Moon, and Mars and Beyond ) that were broadcast on ABC in 1955 and 1957, inspiring a generation of Americans (including myself) on the promise and excitement of space. All three of these books have become collector’s items and can command high prices. Prices can vary considerably with time — check bookfinder.com for current availability. I obtained my copies for review through interlibrary loan. These three books, written for a general audience, are now primarily of historical interest. They provide insight into the expansive vision of Wernher von Braun, an important thinker who was the chief architect of the Saturn V launch vehicle, who was generally considered the father of the U.S. space program, and who was the founding President of the National Space Institute (now the National Space Society). This first book describes the creation of a 250-foot diameter rotating space station. It would have three decks and a crew of 80, and be ferried to orbit with about a dozen flights using 3-stage fully re-usable rockets. The station would be at a highly inclined 2-hour circular orbit at an altitude of 1075 miles, chosen to provide a view of the entire Earth every 24 hours. It would rotate every 22 seconds, providing an artifical gravity of 1/3. It was predicted that the station could become a reality by 1963 at a cost of $4 billion including the development of the 3-stage re-usable rockets (von Braun and company, like other visionaries that followed them, were not immune to overly-optimistic cost projections). Station re-supply and crew rotation for the completed station was predicted to result in a launch every three days. Among the many functions of the station would be to provide Earth-observation and weather monitoring (functions that were later performed by unmanned satellites), to provide a staging area for lunar and planetary missions, and even to perform a military function by potentially being armed with nuclear missiles — “a deterrent which might cause a successful outlawing of war.” This latter possibility was rendered moot by the 1967 treaty which banned weapons of mass destruction in space. An interesting chapter by international law expert Oscar Schachter entitled “Who Owns the Universe?” presages many issues that are still debated today. It was argued that the right of free passage through space, similar to that of the high seas, should be guaranteed. The issue of celestial bodies is more complex, however. Although it was assumed that national sovereignty would not be claimed over celestial bodies, the issue of needing to encourage the development and exploitation of resources found on them was recognized. Little in the way of concrete solutions to this were proposed, and the issue remains unresolved to this day. No mention was made of possible private enterprise development of space resources. We owe a lot to these space visionaries of the 1950s. They helped pave the way both to what has been accomplished and what has yet to be accomplished. See review of second book in this series, Conquest of the Moon.